Urban and domestic violence has become a more pressing problem in Uruguay. 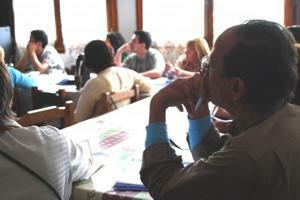 Caritas Uruguay decided to push forward peaceful conflict resolution programmes throughout the country. Peacebuilding leaders will now be trained in the dioceses of Montevideo, Maldonado, Tacuarembó and Salto and function as mediators in parishes, community centres, schools and other settings. “Caritas throughout Uruguay had found violence and crime to be on the rise, especially among young people, in urban areas and within families. This is a problem we cannot ignore,” said Gonzalo Rodríguez Pastore, Executive Director of Caritas Uruguay. Representatives of a wide variety of civil society organizations who were part of an Inter-American Commission of human rights (IACHR) hearing last October cited statistics showing that the rate of the murder of women is significantly higher in Uruguay than in other Latin American countries. The representatives argued that while laws and policies are in place to address domestic violence, they have not been effectively implemented so as to bring about real change for women. As a result of that, victims of domestic violence often don’t even bring charges against their abusers. The Caritas online resource ‘Peacebuilding: Web Toolkit for Trainers’ was translated into Spanish by volunteers from Caritas Uruguay. The web toolkit was developed for trainers, facilitators, learning designers and other practitioners engaged in peace building. The toolkit contains everything a community trainer needs to run effective workshops in their local context. The 200 page resource will provide the peacebuilding activists with support material for their activities. The material from the toolkit is available to the general public and free of charge. “The main objective is to promote a culture of dialogue and help people look for compromises and peaceful solutions to the conflicts we face today. The idea is also to have these leaders pass on their knowledge to others and even train new agents to widen the impact of our programme,” said Mr. Rodríguez Pastore.